Although it's true that apart from reading to the kiddos I finish most of my books curled up in my comfy chair, at heart, I am a very social reader. Goodreads, twitter, e-mails to friends, when I finish a book I like to talk about it. It doesn't always have to be much. Maybe just a line or two. But sometimes, sometimes you get a book that worms its way into your brain and you need to find another reader, a kindred spirit, who can talk to you about it without screaming "Spoilers!" Most of the time, this is something I can do fairly easily. 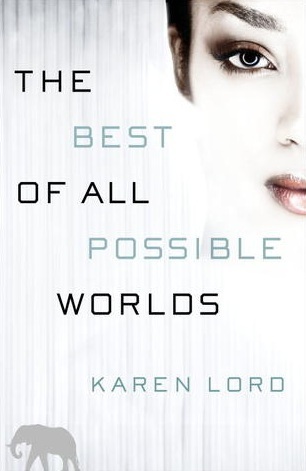 However, I just finished The Best of All Possible Worlds by Karen Lord. It was not quite what I expected. I liked it, but I found myself spending a bit of time muddling through my thoughts as I attempted to write a review. So, of course, I hopped onto Goodreads, thinking I would find a friend who read it. No. Sure, a whole bunch had it "To-Read" but no one was finished with it. I checked with my fellow S4 writers. I thought "It talks about time travel in the blurb. Sara likes that, maybe she has read it." No. With a no from Megan and Meghan too. Dammit to hell, I want to talk about this book with someone. I got lots of "No, did you like it, what is it about" which is good and bad. Good because yay, more people learn about a book, but I have to be careful of spoilers which brings me back to the main reason I wanted to talk to someone who has read the f'ing book. Note: I am freaking annoyed but not at any of my friends. I may be a wee bit obsessive about books, but it's under control. Really. Don't look at me like that! I took to Twitter to ask what books made you need to find someone else who read them too. There are lots of good reads on the list: Feed by Mira Grant, Mark of Athena as well as the Percy Jackson series by Rick Riordan, Tricked by Kevin Hearne, the Parasol Protectorate by Gail Carriger, the Blud series by Delilah S. Dawson, all Neil Gaiman books, the Locke Lamora series by Scott Lynch, The Lunar Chronicles by Marissa Meyer, The False Prince by Jennifer Nielsen, Demon Hunter With Baby by Anna Elliot, and the Alex Verus series by Benedict Jacka. Also of note, Kindle books multiply faster than Tribbles. Thanks for the discussion @Dunny0, @EldritchGirl, @BearMntBooks, @Geese_Juggler, @MattMcC1, @Jessi_Squeakers. Many of the books you mentioned are on my to read list. You'll be hearing from me later. So, have any of you read The Best of All Possible Worlds? Wanna chat? Or maybe you just finished a different book and need to talk about it. Leave a comment here for our own Book Support Group. I'm so sorry! I feel like I let you down. No, really, I know exactly how you feel. 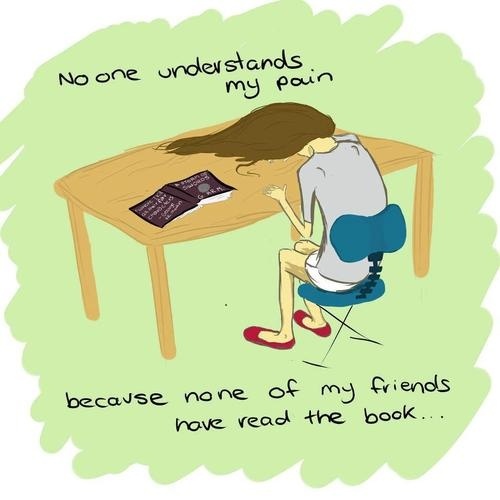 Sometimes you'll find a discussion at the book's Amazon page or at Goodreads, but I'm often stuck with a just-finished book and no one to holler about it with. No, I haven't read it. But I also don't have any friends who read the same type of books I do other than Maria @bearmountainbooks so am very used to keeping it all in my head for most of the books I read. It helps when I write a review of the book but an actual discussion would be very nice once in a while so I feel your pain.